We're Down With The Cats on Instagram! We are thrilled to announce that Petplan® has now given over £5 million to Cats Protection since the beginning of our partnership back in 2001. 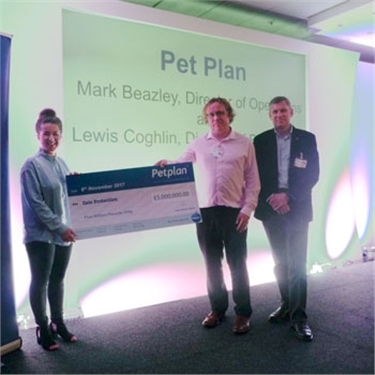 It’s an impressive accomplishment and a testament to the great partnership between the charity and Petplan®, which has brought many benefits to help the cats in our care. Whenever a Cats Protection adopter continues their cover onto a full policy from their four weeks’ free insurance, Petplan® gives 10% of the premium back to the charity and a further 10% each year the policy is renewed. In addition, supporters can get a quote via www.petplan.co.uk/catsprotection which will also trigger 10% of the premium to be donated when the policy is taken out. We celebrated the £5 million target at Cats Protection’s National Conference in November 2017. To read more about how a Petplan® policy helps cats in our care, visit our Meow blog to read Pepper’s story! Thank you so much to our friends at Petplan® for all their hard work and continued support. Petplan is a trading name of Pet Plan Limited and Allianz Insurance plc. Any injury/illness which occurred before your pet’s cover started is a pre-existing condition and will not be covered. Terms, conditions and excesses apply and may be varied at renewal.